Here's a quick share of my experience in shopping through Sedona Lace (http://www.sedonalace.com/) website. 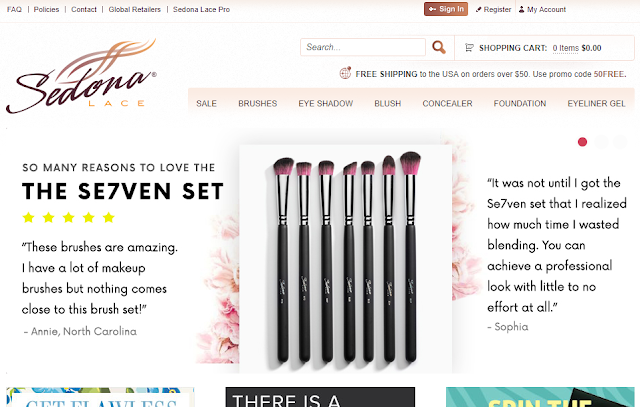 Sedona Lace is a famous makeup brush brand based in United States and a lot of beauty enthusiasts claim that their products are something that will last you for a very long time. You all know how I am into makeup brushes not just because they add aesthetics to the vanity but mainly because they help me apply makeup with confidence. They are something I can always invest on, work with until they are all worn out for as long as I wish without the thought of expiration scaring me. So yeah, I'll forever be an avid fan of quality makeup tools. You can tell because during Black Friday, all I did purchase were brushes. Which is why, I am going to talk about my experience in shopping at Sedona Lace and I hope it helps you in case you are trying to shop overseas too. The website is really not the best but I like that you can easily navigate. Click on something and it displays the entire page, showing all items in that category. It's easier to browse than having to load pages one at a time. They also offer different payment methods but if you are an international buyer, your best bet is to pay through Paypal with your credit/debit card. Sedona Lace offers free shipping by using the code 50FREE (for purchases worth $50 and above) and cannot be used in conjunction with another offer code. Hence, the best time to shop is during sale season when products are automatically discounted so you can still apply the free shipping code on top of it. I placed an order during a holiday sale and everything was at 75% off. Just imagine the savings. I got two brush sets and two Kabuki brushes all for only about $60. I'm also surprised that Sedona Lace did not charge the US sales tax. Sedona Lace do ship internationally. I just found the shipping cost way too expensive so I opted to use a third party courier. I was shopping at another US site anyway so I thought of just consolidating the orders, pay extra for the shipping and so I can also avoid my parcel landing to customs. Long story short, I'll be charged more if I opted for the straight shipping plus, oh gosh, the inconvenience. So there. I placed an order at 11/22/2018. I instantly received a confirmation e-mail regarding the items purchased and quantity and payment approval. My parcel was shipped 12/11/2018. Yup, I waited for like 19 days before I receive an e-mail confirmation about the successful shipping. This is the reason why my other parcels have been stuck at Shipping Cart's warehouse. I am not patient and I don't really like the thought of waiting but because it's about makeup brushes, I've been. My parcel was in transit for about a week until Shipping Cart notified me that they received my parcel from Sedona Lace too. I feel like I didn't really wait in vain because when I sent them an e-mail about my order's status, they replied right away apologizing for the delay and that it was because of the unexpected volume of orders due to Black Friday and Cyber Monday deals. I kind of expect it but I still reached out to them just in case my order was overlooked. I also appreciate the message they probably sent to everyone apologizing again for the delay and that cancellations will be honored. I decided to push through with the order because deals like that don't usually happen and I guess waiting will be worth it. I got myself the Vortex Synthetic Professional Makeup Brush Set ($109.95), 12-Piece Synthetic Professional Makeup Brush Set,($89.95) 480 Synthetic Round Top Brush ($18.95) and 928 Synthetic Flat Top Brush ($18.95). They were packed in individual plastics--no brush belts/cup holders included (you can buy these separately). This is just a minor concern as I prefer acrylic holders for brush storage anyway. Some of the brushes have been shedding already but I know it's too early to judge them based on that alone. I am so happy to tell you that they are indeed soft and they don't prick the skin which is enough to make them stay in my stash. I haven't washed them yet nor use them for full makeup so if you are interested to know what I think about them, just let me know and I'll write them a review. Overall, I love the items I got and I'm positive I'll shop again next time. I'll get more individual and kabuki brushes! I understand the delay in shipping, with the huge markdowns and holidays, what do you expect? If you're not very particular with your budget, shop during regular days, there are coupons everywhere that's best used for bulk orders that you can apply for further discounts. I bet you'll get your item much earlier than you expect. Let me know if you have tried any Sedona Lace brush before!